Enjoy a mystical experience during an unforgettable visit to the Vatican Necropolis and St Peter's Basilica. Visit the Necropolis and discover a real ancient Roman cemetery. Enter the Vatican City State (the smallest state in the world) with this exclusive guided tour of Vatican Necropolis and St. Peter's Basilica! The Vatican Necropolis lies under the Vatican City, at depths varying between 5–12 meters below Saint Peter's Basilica. 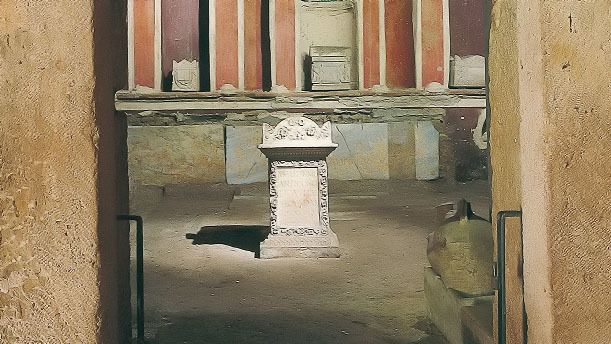 You can explore an authentic Roman cemetery and see graves dating back to the 1st and 4th centuries, including the tomb of the apostle Peter, the first Pope of Christianity. Once you’re done with the Necropolis tour, you’ll reach the St. Peter’s Basilica, the papal enclave within the city of Rome and heart of Catholicism. Marvel at masterpieces of religious art, such as Michelangelo's “Pietà” or the Altar of the Confession. During the tour, you will have the opportunity to pay respect to the tomb of St. John Paul II, the most important Pope of the 20th century. Admire Bernini's “Baldacchino” and visit the “Confessio” or “Chapel of the Confession”, in reference to the confession of faith by St. Peter, which led to his martyrdom. Be amazed by the rich ornamentations of marble, bas-reliefs, sculptures, mosaics and gilded stucco work throughout the cathedral. What are you waiting for? Book now the most exclusive tour of Vatican City! • Clothing MUST be suitable for the HOLY place: PLEASE BE AWARE you NEED long trousers for men and skirts under your knees or trousers for women. Shoulders ALWAYS covered for everyone. GUESTS THAT DO NOT RESPECT THE DRESS CODE WILL NOT BE PERMITTED TO ENTER THE NECROPOLIS. • While visiting the necropolis, visitors might notice the altered environmental conditions of temperature and humidity. Those who suffer from certain pre-existing conditions (including claustrophobia) that could worsen under these conditions, should not visit. • Bulky objects (suitcases, large bags, backpacks of any kind, etc. ), or photographic equipment are not allowed. • Visitors must arrive at the designated meeting point 30 minutes prior to the scheduled tour time and present their ticket/voucher to the tour coordinator/guide. It is the individual responsibility of each visitor to arrive at the meeting point on time. • Official Vatican guides for both the Necropolis (excavations) and St Peter’s Basilica. The meeting point is located – as you face the Basilica – under the right side colonnade, just in the middle, precisely in correspondence of the Police Hurdle. Our staff (wearing a blue jacket with the Vox Mundi logo printed on it) will wait for you to accompany you, through a dedicated gate, inside the Basilica.